I really enjoy scouring the archives to uncover old photographs that show the East End of London as it was around the time of Jack the Ripper. It’s almost spooky to look at those moments in time that were caught by a passing photographer and which, as a result, have been frozen forever – or at least for the foreseeable future – in eerie black and white images. Take the photo of Brick Lane in 1900, for example. You can almost hear the buzz, the hum, the murmuring, the shouting – perhaps a little cursing by the stallholders as people inspect the goods on display. Look at the great big carriage in the background. Has it just unloaded a cargo? Is it waiting for something to be loaded on to it that somebody has just bought? Or is it trying to force its way through the milling throng, much as the modern day cars and trucks attempt to do today. Now, look down to the bottom left hand corner of the photograph. Can you see that little baby being carried in his, or her, mother’s arms? I wonder what sort of life that child went on to have? Did he, or she, survive childhood.? Did they grow up to become a respectable citizen? Did they succumb to the lure of the criminal activity that was rife in the area? Or were they just one of the many children who died in childhood? IS HE UP TO NO GOOD? 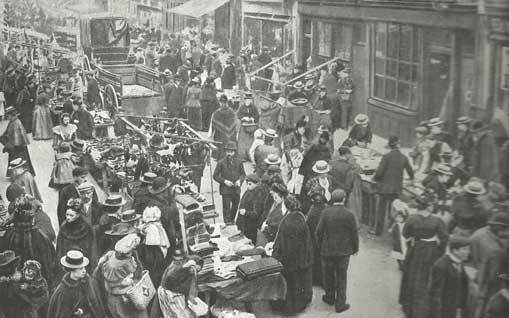 Then, how about that man in what appears to be a bowler hat to the right of the makeshift market stall. What’s he doing? Is he buttoning or unbuttoning his jacket. Is he a sneak thief, on the look-out for a pocket, or two, to pick? Then, there’s the little girl in the white fronted dress and what appears to be a dark coat. She seems to be on her own. Has her mother been distracted by some bargain and taken her eyes off her for the briefest of moments, but long enough for the little girl to wander away and get lost in the crowds? Is the distraught mother shouting or screaming, trying to make her voice heard over the incessant noise of the market, desperate to find her daughter? But, that is the beauty of these old black and white photographs. Yes, they capture moments in history. But, we’ll never know for sure what was actually going on in them. What were the people thinking, chatting about or arguing over? In that respect we have to fill their stories in for ourselves. Look at them, imagine what they would have been like as people. Suddenly, they take on a life of their own, in our imaginations and minds eyes at least – probably completely different lives to the ones the people actually did live. But, that is the beauty of these old photographs. The moments might belong to a bygone time, but the stories are ours to write and imagine. That’s why I love looking at these black and white photographs of old London. The above narrative is my reading of that moment on Brick Lane in the year 1900. What’s your reading of what’s going on? I’d love to hear it. So, why not share it with us on the Facebook page?